The secret to Sean Nolin's success this year really isn't much of a secret at all. In fact, it's an axiom for success as old as baseball itself. "Getting my first pitch over for a strike," said the Dunedin left-hander when asked what the difference has been between last season in the Class A Midwest League and this year in the Class A Advanced Florida State League. Nolin had a respectable 4-4 record and 3.49 ERA with Lansing in his first full Minor League season. But the sixth-round pick by Toronto in the 2010 Draft has been much better this year despite the step up in competition. 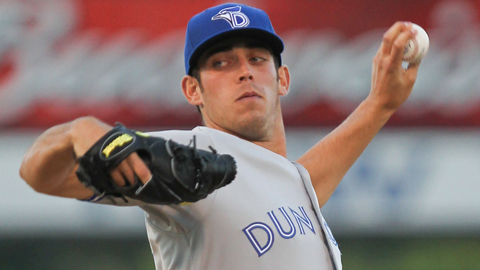 The 22-year-old New York native is 5-0 with a 2.25 ERA in 10 starts for Dunedin. He has 57 strikeouts to 14 walks in 56 innings, and opponents are batting .228 against him. Nolin put up impressive strikeout numbers a year ago, fanning 113 in 108 1/3 innings. That he had just eight decisions in 25 games (21 starts) attested to not being economical enough with his pitches -- though his walk total of 31 wasn't bad. "I was trying to be too fine and falling behind in the count," Nolin said. "Now I'm making sure I start off every hitter with a quality pitch in the strike zone." Nolin, whose best pitch is a low-90s fastball, has been able to do just that. He hasn't allowed an earned run in four of his 10 starts and twice more gave up just one. The 6-foot-5 Nolin didn't yield a run until his third start, and his second outing is still his best. Against Brevard County on April 12, he struck out 11 and did not walk a batter over 5 2/3 innings while allowing three hits. "Hitters in the Florida State League don't chase pitches like they did in the Midwest League," Nolin said. "But if you get ahead early in the count, you put them in a protection mode. I've been able to take charge of the outer third of the plate." Nolin's stock has risen sharply since being mostly overlooked in high school, despite pitching for a successful team at Seaford High School on Long Island. Milwaukee took him in the 50th round of the 2008 Draft after he threw well in a showcase, but he decided to attend junior college power San Jacinto in Texas on the recommendation of an onlooker from Lamar University. "It was definitely a big change," Nolin said of the move to the school near Houston. "I didn't know anyone or really anything about the school." But the drastic change of scenery worked out well. After making just a so-so impression as a freshman, Nolin became one of the nation's best junior college pitchers as a sophomore, and his Draft stock rose dramatically. A 48th-round pick by Seattle in 2009 after his first year at San Jacinto, Nolin vaulted to the sixth round the next year after going 13-0 with a 1.98 ERA as his team was the runner-up in the Junior College World Series. "It was the right time to sign," said Nolin, who got a taste of the Minors with one start in the rookie Gulf Coast League and six in the Class A short-season New York-Penn League. After working hard to fine-tune his mechanics and his physique after that season, Nolin made strides in 2011. But this has been his breakout year. Nolin grew up a Yankees fan on Long Island. If he keeps throwing first-pitch strikes, he someday may be facing that team for the Blue Jays in the American League East. Bradley roughed up: Brevard County's Jed Bradley came off the disabled list after missing only one start with a sore groin muscle, but he allowed 12 hits and five runs -- four earned -- in 4 2/3 innings at Dunedin. The first-round pick by the Brewers in the 2011 Draft had a 5.48 ERA in four May starts after posting a 2.78 ERA over five April outings. The left-hander was 4-4 with a 3.94 ERA overall. Garcia goes on DL: Lakeland outfielder Avisail Garcia had to go on the disabled list because of a strained hamstring. He was hitting .304 with five home runs and 23 RBIs in 42 games. Garcia is ranked as the Tigers' No. 8 prospect. Already on the Lakeland disabled list was outfielder Daniel Fields, Detroit's No. 7 prospect. Cycle attempt all wet: Rain denied Bradenton's Mel Rojas Jr. a chance to hit for the cycle on his 22nd birthday. The outfielder was 3-for-3 with a home run, double and triple Thursday when a game against Lakeland was called after the top of the seventh inning with the Marauders winning, 6-2. Rojas is the son of the former Major League reliever with the same name. Vlad goes deep: Vladimir Guerrero was 2-for-5 with a home run against Brevard County in his first game for Dunedin after signing with Toronto as a free agent. The longtime designated hitter has 449 Major Leagues homers and a .318 career average. He hit .290 for the Orioles last season. Guy Curtright is a contributor to MLB.com. This story was not subject to the approval of the National Association of Professional Baseball Leagues or its clubs.